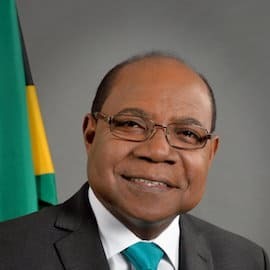 Recognised for his extensive expertise and accomplishments in the political arena, the Honourable Edmund Bartlett has served 25+ years in Jamaica, working both in the Senate and in the House of Parliament. Beyond the duties of his assigned portfolio, Minister Bartlett has always championed the advancement of education for his constituents across all age groups in East Central St. James. His efforts have resulted in benefits, rewards, and scholarships for both children and teachers, raising the bar on educational achievements. Similarly, the Minister has created opportunities for the development of skills in diverse trades, thereby enabling higher rates of employment and small business ownership. The welfare of the elderly and disabled also has been a prime focus of initiatives undertaken to enhance lifestyle in the constituency. In his 34 years in public life, Minister Bartlett has served in diverse roles. He was Minister of State in the Office of the Prime Minister and Minister of Youth, Sports and Community Development from1980 to 1989; he served as Senator and Opposition Spokesman of various portfolios, including Tourism, from 1989 to 2007. Appointed Minister of Tourism in 2007, Mr. Bartlett already had a solid track record of service as a legislator in central government in both Chambers of the House. In the Upper House he served as a senator, and in the Lower House as a Member of Parliament, a position he continues to hold. The Minister has distinguished himself as an outstanding legislator and parliamentarian, and as a government minister. Throughout his career, Minister Bartlett’s representation of Jamaica at major conventions and conferences, both national and international, has invariably been exemplary. In his role as Minister of Tourism, he has set a new standard, keeping his team tirelessly in motion to maintain an extraordinary performance level. Defying all odds through a time of global economic upheaval, he has achieved stellar results, positioning Jamaica as one of only two countries in the Caribbean region currently demonstrating positive growth in tourism, and ranking among the top 10 destinations in the world. In May 2010, Minister Bartlett was honoured by Spain and made a Commander of Number of the Order of Civil Merit for the pivotal role he has played in facilitating several multi-billion dollar investments in Jamaica’s tourism sector. He currently serves as vice chairman of the Commission for the Americas (CAM) of the United Nations World Tourism Organization (UNWTO) and is a member of the Executive Council of UNWTO. He has additionally served as vice president for the World Conference on Cultural Policies; as vice chairman of the U.N. International Youth Year Advisory Committee; and as vice president of the 2009 UNWTO conference held in Kazakhstan. The Minister is the founder of the Jamaican Foundation for Children, which he continues to support. A graduate of the University of the West Indies, where he majored in accounting, Mr. Bartlett served in the private sector in the role of marketing and sales manager, as well as senior accountant, for major multi-national companies in Jamaica prior to entering elective politics. According to the United Nations World Tourism Organization, tourism provides one in 10 jobs globally, and even more in developing countries. In the Caribbean, for instance, it directly or indirectly creates nearly one in every five jobs. The Conference on Jobs & Inclusive Growth: Partnerships for Sustainable Tourism will explore how tourism can "create good jobs, provide opportunities for inclusion and education, and assist in preserving cultural heritage and the environment." NextBillion will be a media partner at the event.